Yesterday night, the French-flagged yacht "Anahita", an aluminum Ovni 345, sank in Ballot Strait of the Northwest Passage. The disaster occurred in Depot Bay, just east of Bellot Strait. According to initial information, the ship was trapped by drifting sea ice from which it could not escape. The course of "Anahita" from Nuuk on the coast of Greenland went via Baffin Bay to Pond Inlet and on to the entrance of Bellot Strait. There the skipper allowed the yacht to get into floating sea ice and sink. 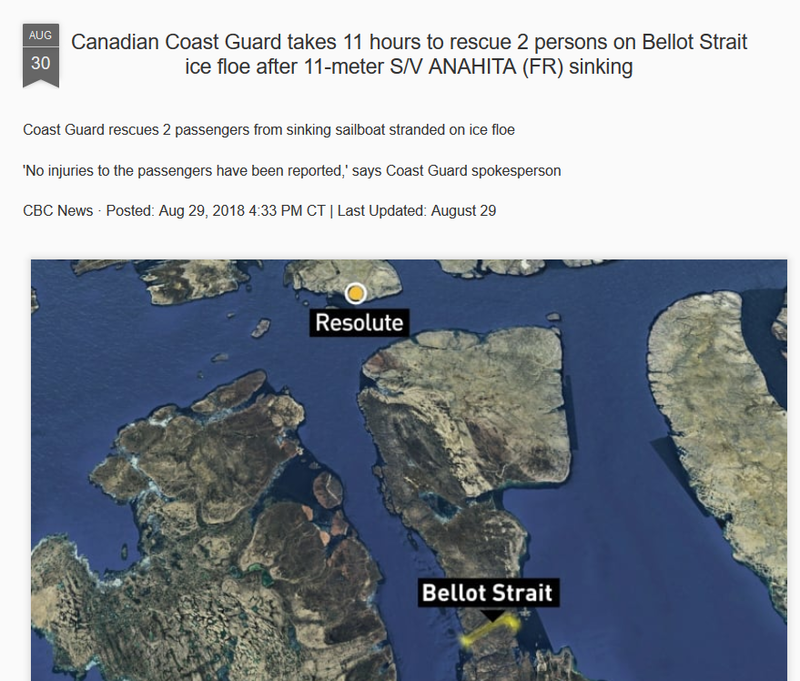 Under the pressure of the ice and current of Bellot Strait, the "Anahita" then ruptured and began leaking resulting in sinking. The crew, two Argentines, had to flee to the drifting sea ice floes. However, they still managed to drop an emergency call and activate the epirb of the boat. It sent just long enough for the Canadian SAR in Trenton Ontario station to start a rescue operation. Both men have since been taken in by other nearby yachts who responded to the "Mayday". And this despite the fact that all the crews presently in the region with their yachts have had a great need to bring themselves and their ships to safety in the last hours in front of rising drifts of sea ice floes. The Anahita, like about a dozen other yachts, was on its way east-west through the Northwest Passage. This summer, however, the ice in the Arctic is persistent. Unlike in previous years, so far there has not been a clear path. So the crews had no choice but to practice patience. Or turn around. The skipper of the "Anahita", Pablo David Saad, had deliberately ignored the official warning and instead oriented himself to the skipper of another yacht, who has traveled the passage several times and who had been hoping in the last few days still for a withdrawal of the ice , Saad has been on long-distance sailing for several years with changing crews. He as well as his current companion come from San Martín de los Andes, a city in southwestern Argentina near the border with Chile. This time the skipper and his crew were extremely lucky to come out alive. But sooner or later, Arctic alarmists, with their lies about disappearing sea ice, will have deaths on their conscience. Completely irresponsible wasting the time and effort of Coastguard personnel not to mention the cost of the rescue. These waters are no place for yachts, it’s total madness. Just 8 days ago, we were introduced to the intrepid 6 of the Dogbark. At least they turned back without needing to be rescued. A clear signal that we are headed for global cooling… again? Just switch the plus to a minus. The sooner one of these idiots dies in the ice and the news gets around the World the better. But then I guess the BBC and its print friends the Guardian will suppress it. No, they will blame it on climate change, somehow. Less ice, more ice, it doesn’t matter. You’re assuming that they have a conscience. The DMI ice volume images paint a picture that these sailors seem to be ignoring, stepping back to about 22 August it can be seen that ice cover started to increase from that date for that region compared to last year for the same dates when ice cover continued to decrease. It’s a simple case of miscommunication of consensual… conscientious…AH!..consensus among some scientists .Since he decreed it so, obviously High Priest A. Gore must have forgot to CC The Arctic that it was to be ice free by now. Or maybe it’s because the US pulled out of the Paris (non)Treaty,..or, uh… the US has cut back too much, too fast on CO2 emissions. I sure hope these tourists and ecological scientists stop polluting the Arctic with all of their sailing vessels. After all, polar bear lives matter. Just because we had a really warm year in 2013 and due to all the global warming hype. Everyone is still believing Al Gores prediction that by year 2013 there will be no ice left at either poles. For 3 years now our sun has entered a hibernation phase which it does every 400 years like clock work. The polar Ice has returned to it’s original coverage and thickness and is still increasing. Big research ships have been needed rescuing by ice breakers in the last two years, and they still don’t get it. Global warming is just a Media Hoax. Just follow the money. The impact of Climate change is not consistent month to month or year to year . That’s the nature of the weather. Anyone who expects a straight line change is niave or an ideolog looking to make points. ” Arctic alarmists, with their lies about disappearing sea ice, will have deaths on their conscience.” Surely, you are not serious?